Pinky Bells is a deciduous shrub with unique summer blooms. It would do well as a foundation planting in your yard or perhaps as a charming container plant for your backyard patio. Your Pinky Bells lives up to its name. This shrub features adorable pendulous flowers that dangle from the stems like little bells from mid-summer to fall. The 5-petalled blooms are a delicate pink and are easily the largest flowers of the Abelia varieties available. Your yard's hummingbirds and butterflies will appreciate its fragrant presence in your yard as well, and further reward you with their delightful presence. Pinky Bells new growth is red, so even when not in bloom, your Pinky Bells will contribute some added interest to your landscape. Red color in the fall will spice up your autumn yard as well. It also has a gently mounded form so is naturally attractive, but adapts well to pruning if you'd like to shape it a bit. 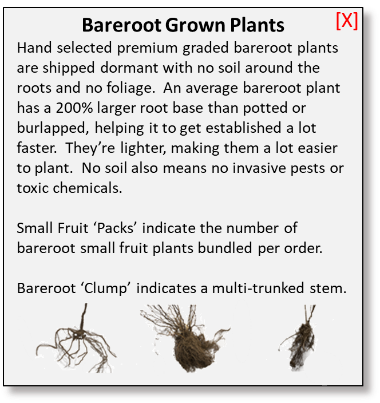 It's known for having a strong root system and is relatively hardy. Even the neighborhood deer will leave it alone. A lovely shrub with enchanting flowers to provide color year-round, the Pinky Bells is an outstanding choice for your yard this year.